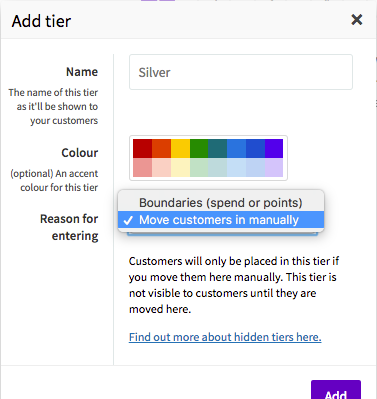 Hidden tiers are not displayed in the list of tiers to shoppers. It allows tiers to be flagged as "secret". Having a super secret VIP tier above the regular tiers. Wholesalers: Their purchasing habits are different from regular shoppers so set wholesale users to earn points at a different rate because. you don't want them to miss out on loyalty program!